For the second time this season, a Yankee pitcher flirted with a no hitter, but came up short in the 8th. Unlike Sabathia’s earlier attempt, however, Phil Hughes’ pitch count was a much more manageable 88 when the A’s finally broke through, so there would have been no question about his ability to finish the game. It wasn’t meant to be, but Hughes did earn his second win of the season after Joba Chamberlain and Mariano Rivera closed out the game. Phil Hughes expresses disappointment over lost no-hitter bid, but the Yankees righty did strike out a career-high 10 batters (Photo: AP). Hughes came out of the gate throwing gas and throwing strikes. After a first inning walk to Daric Barton, he retired the next 20 batters until Eric Chavez singled off his glove for the A’s first hit. As much as it stings to lose a no hitter on an infield hit, it sure beats how Hughes lost his last no-hitter bid. While watching Hughes deal, I am sure many Yankee fans joined me in flashing back to May 1, 2007. Like tonight, Hughes, who was then making his second career start, breezed through the Texas Rangers’ lineup. By the time the 7th inning rolled around, the Rangers still had no hits on the scoreboard. Then, fate took a hand, and Hughes’ hand grabbed for his hamstring. The injury would set Hughes career back for several years. Needless to say, the no hitter was lost. Efficient isn’t even close to being a suitable explanation for how precise Hughes was in the game. He mostly featured a mid-90s fastball (58% of fastballs were at least 93mph) in the early going, but relied more on his cutter as the game went on. Hughes also sprinkled in the occasional curve, but did not throw a single change-up (see breakdown chart below). Hughes was so confident in his fastball that he often shook off Posada’s call for an off speed pitch, including during two consecutive batters in the fifth inning. In that sequence, Hughes shook to a fastball to strike out Kevin Kouzmanoff and induce a pop up from Gabe Gross. In total, Hughes threw 101 pitches, of which 71 were strikes. Until the 8th inning, Hughes never threw more than four balls in any one inning. Despite not making history with a no-hitter, Hughes did strike out a career high 10 batters, including every A’s starter except Ryan Sweeney. His previous high of 9 was set on May 20, 2009 in a five inning stint against the Orioles. Hughes’ 10 strikeouts were also the most by a Yankee pitcher since AJ Burnett struck out 11 Angels on September 23, 2009. In defeat, Ben Sheets pitched well after a shaky first inning. The A’s righty was the first opposition starter to complete six inning against the Yankees since CJ Wilson went the distance in Friday’s rain shortened game against the Rangers. Robinson Cano snapped an 0-29 drought at McAfee Coliseum with a second inning single. In the fourth inning, Alex Rodriquez and Cano hit back-to-back triples to produce the Yankees first two runs. It was the first time Yankee batters had consecutive three baggers since August 25, 2007 when Melky Cabrera and Johnny Damon performed the feat against the Tigers. Arod now has two triples on the early season, the most he has had since 2004. A’s reliever Jerry Blevins left the game in the 8th inning with an undisclosed back injury. In a poignant moment, Phil Hughes saluted his parents, who were seated behind the dugout, as he walked off the mound. Before the game, Brian Cashman presented Xavier Nady with his World Series ring. Nady was at Citi Field for the Cubs series against the Mets. The Yankees short circuited a first inning rally when Derek Jeter was thrown out trying to steal 3B on a 3-2 pitch to Mark Teixeira that ended in a strikeout. 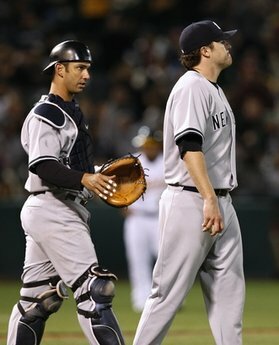 On the first night as the installed 8th inning guy, Joba Chamberlain was called upon to rescue Phil Hughes from a jam. Chamberlain allowed one of the inherited runners to score before retiring the side. Interestingly, Girardi was quick to go to Mariano in last night’s game, when the team had a 4-run lead, but allowed Joba to work the 8th in tonight’s much tighter situation.